Three poems by Anne Mounic. forged from long years with those one’s learned to love. the duel’s now more one-sided than before. forgotten shapes in leisure on the land. erosions or those sudden rifts in earth. can also try arresting sleights of hand. traces its silhouette on water. reflect itself rather than disappear. about to flourish green once more. its own infinity, conceivable florescence. and let so slowly arias unfold. its own appropriate centre for itself. from what’s becoming to accomplishment. Anne Mounic is a lecturer at Paris 3 Sorbonne Nouvelle, a co-editor of Temporal, a poet, a critic and a translator of Robert Graves, Stevie Smith and Vincent O’Sullivan among others. She is also the author of Counting the beats: Robert Graves’ poetry of unrest, ‘an existential view of Graves’ poetic, historical, and critical work’. 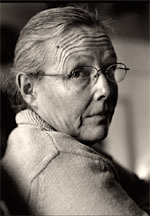 A painter and engraver, she exhibits regularly both individually and with her husband, Guy Braun. Their website is here. Harry Guest’s latest publication (from Impress) is A Square in East Berlin, a translation of Torsten Schulz’s acclaimed novel Boxhagener Platz (which has been successfully filmed). He reviewed ‘Anthony Rudolf’s literary Wunderkammer’, silent conversations, for the Fortnightly here and his translation of Gautier’s preface to ‘Émaux et camées’ is here. Publication: Friday, 12 December 2014, at 18:09. Options: Archive for Anne Mounic, Harry Guest. Bookmark the permalink. Follow comments here with the RSS feed. Post a comment or leave a trackback. ‹ The preface to ‘Émaux et camées’.